Andy’s passion for plants is clear. What he enjoys most about his job is helping people to get closer to the natural world. He points out that most of us think about the natural world in terms of the diversity of animals that exist. But we forget about the extraordinary diversity of plants, the primary producers that form the basis of our ecosystems. 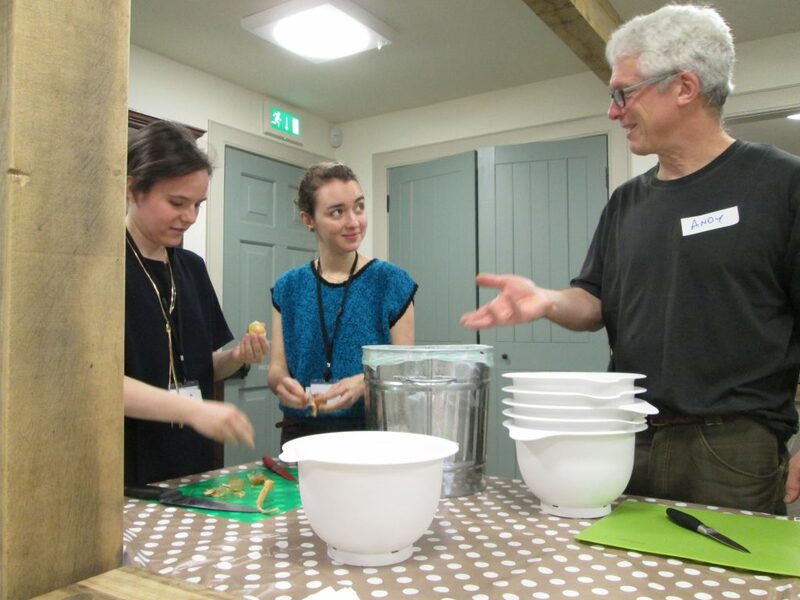 Andy discussing food (his favourite subject) with Fanni and Cristina in the Botanic Cottage kitchen. He is a busy and ever enthusiastic character. As a Community Gardener at the Botanic Gardens, he runs workshops with a variety of different groups from the local community. Attendees range from four year olds to groups with additional support needs. He shares his knowledge of plants from the sowing of seeds to cooking the harvested produce. When we asked Andy about his professional background, he replied “how long have you got?” We discussed his life as an engineer, education software developer and entrepreneur. However, his passion for his allotment bought him to the Edible Gardens. As we move on to talk about issues concerning food security, it is clear Andy has thought a lot about them. For him, “nutritious food” means knowing what is in your food and where it is coming from. As well as having access to variety. To him the term “food security” means having the confidence that you will be able to eat well into the future. We discuss Scotland’s high quality agricultural produce. “Where does our produce go?” says Andy. It seems that Scotland has the natural resources, such as fertile land and water supplies, to produce enough fresh food for the population, but it can’t be easily accessed in some local communities. Consequentially, local communities become increasingly out of touch with food producers and the land itself. A logical solution follows on from this problem: We should encourage localisation of food supply chains. He emphasises that if we eat more local produce we may be able to better control quality and distribution. But, he acknowledges that this is a balancing act. For example, we all share a love of bananas. But they aren’t native to Scotland. We ask Andy how he thought we could improve people’s diets. He replied “ask them”… and that is what the “Big Picnic” project is all about. He feels it is apparent that top-down approaches do not always work. Only by sharing experiences can we be empowered to find solutions.